I’ve been wanting to try Tom Brady’s TB12 meal-kit delivery service by Purple Carrot since it launched more than a year ago. While I’m not a football fan, or even a Tom Brady fan (although I do think he’s pretty cute), I do eat a mostly plant-based diet similar to the sports star (admittedly, I don’t eat plant-based 100 percent of the time, but I try). With a schedule that’s been more hectic than usual the past few months, I’ve been finding it too much of a chore to decide what recipes I want to make, go the grocery store to get the ingredients, and then spend time preparing a decent home-cooked meal. Therefore, my husband and I have been going out to eat all-too-often and our diet has been slacking (hello winter pounds). 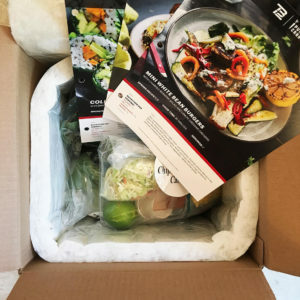 So a couple weeks ago I decided to finally order the TB12 Performance Meal Kit. If you’re not familiar, for $78 a week ($13 per meal per person), you get a box filled with ingredients to make three meals that serve two people each. 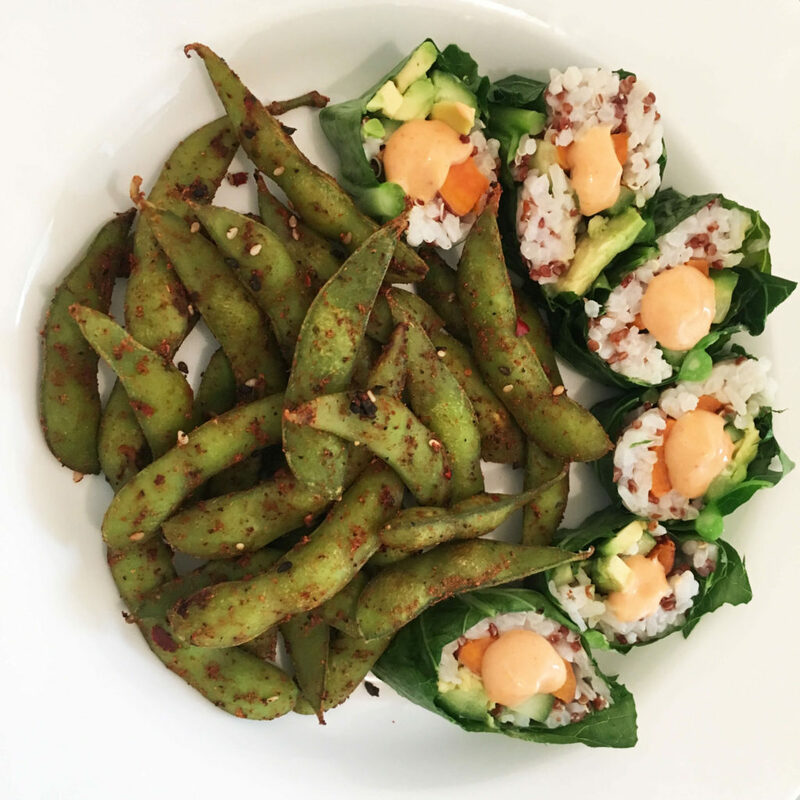 The meals are vegan, gluten-free, high in protein, with limited use of added sugar and soy. I opted to make the chipotle roasted carrots on the first night (yes, the dish even included a purple carrot – very apropos). The recipe card said the meal would take about 30 minutes to make, but it took me a bit longer – maybe about 45 minutes or so. But the wait was definitely worth it. The dish was PHENOMENAL, and even my husband agreed. Honestly, I was hoping the meal would taste decent, but I didn’t expect it to taste THAT good. I even had a small amount of leftovers that I took for lunch the next day. The ingredients for each recipe come individually wrapped. The food tastes incredible (as I mentioned earlier, even my husband loved it and he is not a vegan/vegetarian). You don’t have to grocery shop (except for other essentials you may need during the week … For me, that means smoothie ingredients, but that took all of 10 minutes to get). You can reduce your food waste by not over-buying food at the grocery store. You can put your subscription on pause if you go away on vacation. If you’re not a fan of waste, the kit seems to create a lot of it. All of the ingredients are individually wrapped, and items like veganaise and other sauces come in little plastic jars). I recycled all of the plastic bags (I bring them to Whole Foods), and offered the plastic jars to my sister to use in her art class (I will recycle the rest). Purple Carrot does offer suggestions on their website on how to recycle and upcycle the packaging. Each meal contains 700 – 1,000 calories, which seems fairly high (but read my tips below for a way to cut out some of the cals). Read all of the ingredients and directions first before cooking. For example, in my first meal, I added all of the cilantro and lemon to the coleslaw rather than saving half of each to mix into the quinoa. If a recipe calls for parchment paper, it’s in the box. I didn’t realize this until after throwing out what I thought was just a piece of paper. 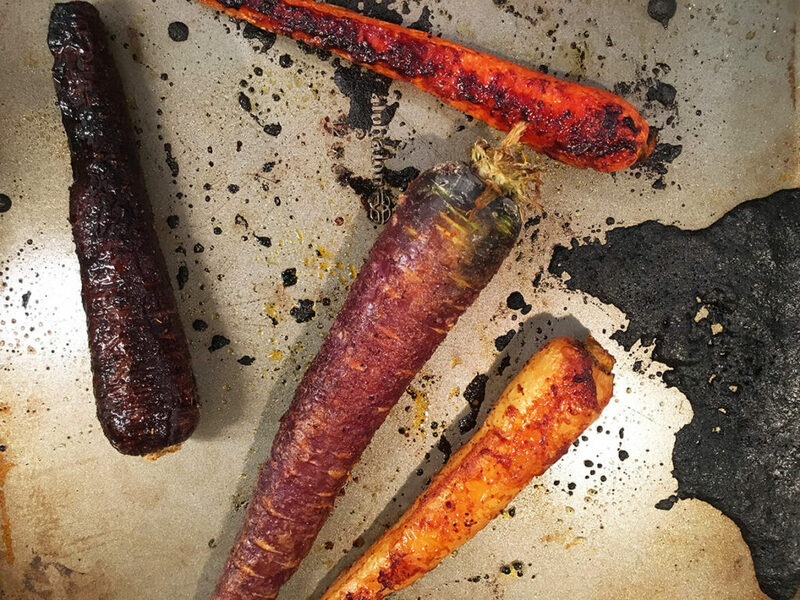 And because of it, my baking sheet looked (and still looks) like a hot burnt mess after roasting carrots in the oven. 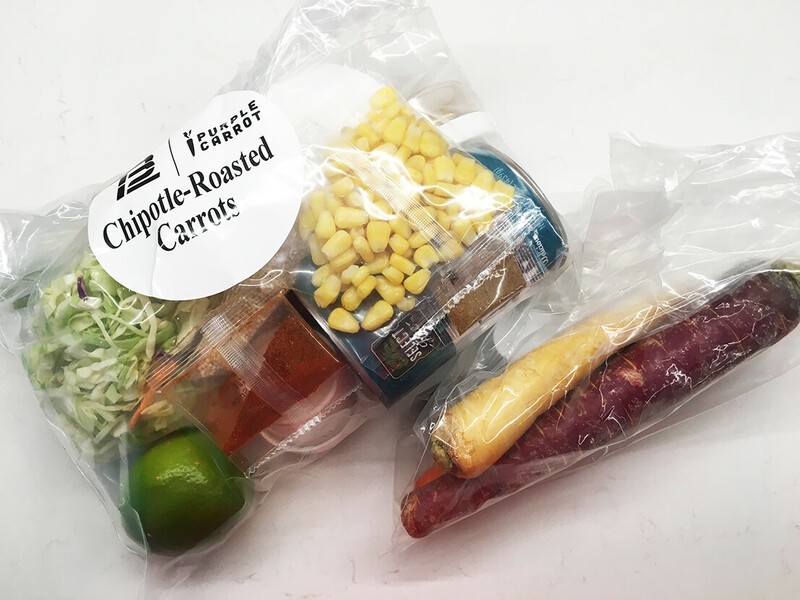 If you think you’re missing an ingredient, check to see if it’s in one of the other recipe bags (each recipe comes in its own bag). I didn’t think I had any garlic for the chipotle carrot recipe, but realized afterwards it was in the bag for the mini white bean burgers. My hot-mess-of-a-baking tray after accidentally throwing out the parchment paper that came in my TB12 box. If you you want to reduce the calorie count of a meal, use less oil, or use less sauce. Also, the recipes called for vegetable oil, but I prefer to use coconut oil, especially when I’m cooking on high heat. By the way, before I ordered my first TB12 box, I read some of the reviews, including this one from Moneyish.com. The author clearly did not have the same experience I did. She said her meals were too complicated to make and didn’t fill her up (she ended up ordering Domino’s). To that, I say, if you’re not use to eating plant-based, yes, you may struggle. If you’re used to eating more processed dinners, your body will probably still crave those types of food when you first give it up. 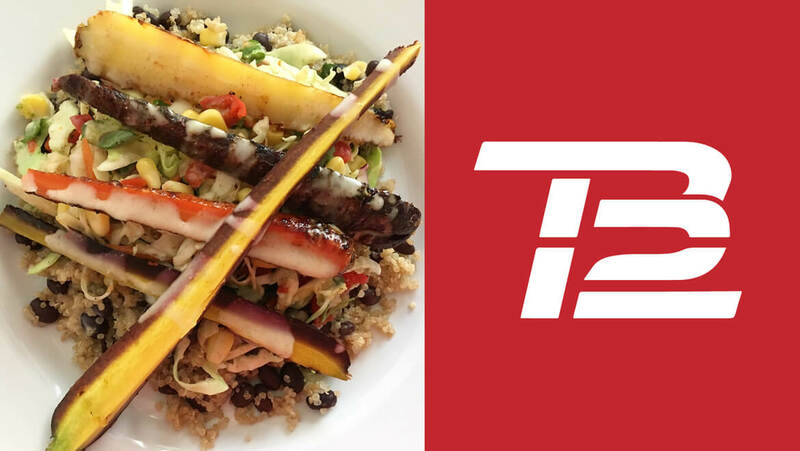 But the longer you stick with a plant-based diet, and the more you learn about the importance of nourishing your body with “real,” unadulterated food, the easier and more enjoyable TB12 will become. So will I continue with my TB12 subscription? Definitely. I can’t wait until this week’s box arrives on my doorstep.